Without a Little Rain by Avery Raquel is a nine track Album and was released online on 4th April 2017. Labelled as R&B/Soul, it is without a doubt very soulful and I literally fell in love with the album from the moment it started to play when I checked it out on Spotify. It's a well produced album of six original tunes and three covers, and features a multitude of instruments, which provide all the right sounds in all the right places, accompanied by beautiful vocals, all of which is at volumes which compliment each other, rather than overpowering each other. The album is reminiscent of an intimate gig where you would be up and close to the artist, allowing you to enjoy the refinements of the compositions. I believe Canadian native, Avery is still only 15 years old, if that is the case then this album really is truly remarkable, as you could easily be fooled into thinking it is a well established, much older artist singing. Since finding this album on Spotify, I haven't played anything else and I'm in danger of over playing it, which would then quickly make me bored of it, so I've got to cut back on listening to it and start listening to other music so that the magic of it lives on. Check it out and see if it gets you hooked, like it has me. 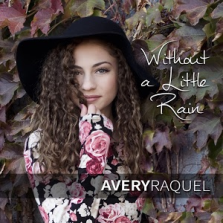 Without a Little Rain by Avery Raquel is available to download or stream on all of the usual sites/platforms and a physical copy can be bought from Avery's website. Unusually, a limited edition vinyl copy is also available to buy on Avery's website, which is a nice touch.